"The period between Adam and Noah was ten centuries." He was Noah Ibn Lamik, Ibn Mitoshilkh, Ibn Enoch, Ibn yard, Ibn Mahlabeel, Ibn Qinan, Ibn Anoush, Ibn Seth, Ibn Adam the Father of Mankind (pbuh). According to the history of the People of the Book, (refers to the Jews, and Christians, so called by Allah because they received Revealed Books, Taurat, Zabur and Injeel. These names are translated ´Torah, Psalms, and Gospels´ respectively, but the books that are extent are corrupt. Of the Revealed Books, ONLY the Quran remains exactly as it was revealed). Ibn Abbas (may Allah be pleased with him) narrated that the Prophet Muhammad (peace and blessings of Allah be upon him) said: "The period between Adam and Noah was ten centuries." (Sahih Bukhari, Noah was born 1056 years after Adam´s creation (or after he left the Garden of Eden). Thus, this hadith does not contradict the previous statement from the People of the Book as it may first appear to do. The reader should keep in mind, however that any statement or narratives taken from the People of the Book are not necessarily credible. This was taken from Genesis 5). For many generations Noah´s people had been worshipping statues that they called gods. They believed that these gods would bring them good, protect them from evil and provide all their needs. They gave their idols names such as Waddan, Suwa´an, Yaghutha, Ya´auga, and Nasran, (These idols represented, respectively, manly power; mutability, beauty; brute strength, swiftness, sharp sight, insight) according to the power they thought these gods possessed. Ibn Abbas (may Allah be pleased with him) explained: "Following upon the death of those righteous men, Satan inspired their people to erect statues in the places where they used to sit. They did this, but these statues were not worshiped until the coming generations deviated from the right way of life. Then they worshipped them as their idols." In his version, Ibn Jarir (may Allah be pleased with him) narrated: "There were righteous people who lived in the period between Adam and Noah and who had followers who held them as models. After their death, their friends who used to emulate them said: ´If we make statues of them, it will be more pleasing to us in our worship and will remind us of them.´ So they built statues of them, and , after they had died and others came after them, Iblis crept into their minds saying:´Your forefathers used to worship them, and through that worship they got rain.´ So they worshipped them." Worshipping anything other than Allah is a tragedy that results not only in the loss of freedom; its serious effect reaches man´s mind and destroys it as well. Almighty Allah created man and his mind with its purpose set on achieving knowledge the most important of which is that Allah alone is the Creator and all the rest are worshippers (slaves). Therefore, disbelief in Allah, or polytheism, results in the loss of freedom, the destruction of the mind, and the absence of a noble target in life. (By worshipping anything other than Allah, man becomes enslaved to Satan, who is himself a creature and becomes harnessed to his own baser qualities). Into this environment Allah sent Noah with His message to his people. Noah was the only intellectual not caught in the whirlpool of man´s destruction which was caused by polytheism. Therefore, he explained to this people, there cannot have been more than one deity. He clarified to them how the devil had deceived them for so long and that the time had come for this deceit to stop. Noah spoke to them of Allah´s glorification of man, how HE had created him and provided him with sustenance and the blessings of a mind. He told them that idol worshipping was a suffocating injustice to the mind. He warned them not to worship anyone but Allah and described the terrible punishment Allah would mete out if they continued in their evil ways. Noah´s people were divided into two groups after his warning. His words touched the hearts of the weak, the poor, and the miserable and soothed their wounds with its mercy. As for the rich, the strong, the mighty and the rulers they looked upon the warning with cold distrust. They believed they would be better off if things stayed as they were. Therefore they started their war of words against Noah. First they accused Noah of being only human like themselves. ´The chiefs of the disbeliveers among his people said: "We see you but a man like ourselves. "´ (Ch 11:27 Quran) He, however, had never said anything other than that. He asserted that, indeed, he was only a human being; Allah had sent a human messenger because the earth winhabited by humans. If it had been inhabited by angels Allah would have sent an angelic messenger. Thus the conflict between Noah and the heads of his people intensified. The disbeliveers tried to bargain: "Listen Noah, if you want us to believe in you, then dismiss your believers. They are meek and poor, while are elite and rich; no faith c an include us both." Noah listened to the heathens of his community and realized they were being obstinate. However, he was gentle in his response. He explained to his people that he could not dismiss the believers as they were not his guests but Allah´s. Noah continued appealing to his people to believe in Allah hour after hour, day after day year after year. He admonished his people and called them to Allah day and night, in secret and openly. HE gave them examples, explained Allah´s signs and illustrated Allah´s ability in the formation of His creatures. But whenever he called them to Allah, they ran away from him. Whenever he urged them to ask Allah to forgive them, they put their fingers in their ears and became too proud to listen to the truth. He said: "O my Lord! Verily, I have called my people night and day (secretly and openly to accept the doctrine of Islamic Monotheism), but all my calling added nothing but to their flight from the truth. Verily! Everytime I called unto them that You might forgive them, they thrust their fingers into their ears, covered themselves up with their garments, and persisted (in their refusal), and magnified themselves in pride. Then verily, I called to them openly (aloud); then verily, I proclaimed to them in public, and I have appealed to them in private, I said to them: ´Ask forgiveness from your Lord, Verily, He is Oft Forgiving; He will send rain to you in abundance, and give you increase in wealth and children, and bestow on you gardens and bestow on you rivers." See you not how Allah has created the seven heavens one above another, and has made the moon a light therein and made the sun a lamp And Allah has brought you forth from the dust of earth. Afterwards He will return you into it (the earth), and bring you forth (again on the Day of Resurrection) Allah has made for you the earth wide spread (an expanse) that you may go about therein broad roads. Noah said: "My Lord! They have disobeyed me, and followed one whose wealth and children give him no increase but only loss. They have plotted a mighty plot. They have said: ´you shall not leave your gods, nor shall you leave wadd, nor Suwa, nor Yaghuth, nor ya´uq nor Nasr (names of the idols). Indeed they have led many astray. O Allah! Grant no increase to the Zalimeen (polytheists, wrongdoers, and disbeliveers etc) save error." Noah chose a place outside the city, far from the sea. HE collected wood and tools and began to day and night to build the ark. 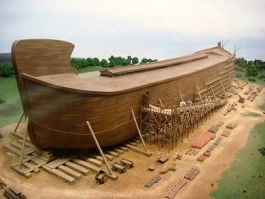 The people´s mockery continued: "O Noah! Does carpentry appeal to you more than prophethood Why are you building an ark so far from the sea Are you going to drag it to the water or is the wind going to carry it for you " Noah replied: "You will come to know who will be put to shame and suffer." The ship was constructed, and Noah sat waiting Allah´s command. Allah revealed to him that when water miraculously gushed forth from the oven at Noah´s house, that would be the sign of the start of the flood, and the sign for Noah to act. The terrible day arrived when the oven at Noah´s house overflowed. 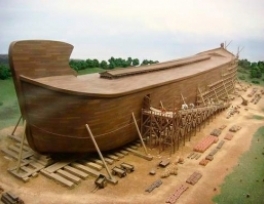 Noah hurried to open the ark and summon the believers. He also took with him a pair, male and female, of every type of animal, bird and insect. Seeing him taking these creatures to the ark, the people laughed loudly: "Noah must have gone out of his head! What is he going to do with the animals "
Noah´s wife was not a believer with him so she did not join him; neither did one of Noah´s sons, who was secretly a disbeliever but had pretended faith in front of Noah. Likewise most of the people were disbeliveers and did not go on board. The scholars hold different opinions on the number of those who were with Noah on the ship. Ibn Abbas (may Allah be pleased with him) stated that there were 80 believers while Ka ab al Ahbar held that there were 72 believers. Others claimed that there were 10 believers with Noah. "And [Noah] said, "Embark therein; in the name of Allah is its course and its anchorage. Indeed, my Lord is Forgiving and Merciful. And it sailed with them through waves like mountains, and Noah called to his son who was apart [from them], "O my son, come aboard with us and be not with the disbelievers." [But] he said, "I will take refuge on a mountain to protect me from the water." [Noah] said, "There is no protector today from the decree of Allah , except for whom He gives mercy." And the waves came between them, and he was among the drowned. And it was said, "O earth, swallow your water, and O sky, withhold [your rain]." And the water subsided, and the matter was accomplished, and the ship came to rest on the [mountain of] Judiyy. And it was said, "Away with the wrongdoing people." And Noah called to his Lord and said, "My Lord, indeed my son is of my family; and indeed, Your promise is true; and You are the most just of judges!" He said, "O Noah, indeed he is not of your family; indeed, he is [one whose] work was other than righteous, so ask Me not for that about which you have no knowledge. Indeed, I advise you, lest you be among the ignorant." [Noah] said, "My Lord, I seek refuge in You from asking that of which I have no knowledge. And unless You forgive me and have mercy upon me, I will be among the losers." Noah released the birds, and the beats which scattered over the earth. After that the believers disembarked. Noah put his forehead to the ground in prostration. The survivors kindled a fire and sat around it. Lighting a fire had been prohibited on board so as not to ignite the ship´s wood and burn it up. None of them had eaten hot food during the entire period of the floor. Following the disembarkation there was a day of fasting in thanks to Allah. The Quran draws the curtain on Noah´s story. We do not know how his affairs with his people continued. All we know or can ascertain is that on his deathbed he requested his son to worship Allah alone, Noah then passed away.